I just so desperately wish I could go back and hug my new mom self in the thick of having a newborn. That’s what I needed; a hug. Not new baby clothes, not visitors asking me for a cup of tea when I could barely walk with the diaper and icepack between my legs. Not fumbling under a blanket trying to nurse my baby so I didn’t offend visitors when I had no F*ing clue what I was doing. What I needed was to lock eyes with my newborn and let the oxytocin flood my system as our bond formed without distraction. I needed someone to remember that although the new baby needed care, I needed care too. I needed a shoulder to cry on or at the very least a nap. Someone to tell me that the love will come, boy would it come. That these feelings will pass, breastfeeding will get easier, and that I would sleep and feel like a normal human again soon. But that I would never, ever be my former self. Because now I am a mother and had entered a sacred sisterhood. One where the initiation was intense and the transformation profound. I needed someone to say Welcome, we know. I felt asking for anything meant that I couldn’t hack it. Or that not feeling happy meant that I didn’t love my baby. I remember thinking women became mothers every day, birth was a normal occurrence, something women have always done and multiple times over. But to me it seemed so much more than ordinary. It was anything but; to me is was extraordinary. It was such a tremendous physical and emotional feat. I had never, ever done anything so labor intensive, so strenuous, so physical, so emotional in my ENTIRE life. I was reeling from the experience. I was still grasping the grandeur of it all. My mind was still back in the delivery room where I was shocked and terrified at the intensity and pain of contractions. Or in the hospital room where I was recounting my birth story over and over in my head, so proud of it but also so shell-shocked by it. The fact that there was a baby who needed me immensely seemed almost like an afterthought. I suddenly had a new found awe and respect for mothers everywhere but also felt separated from them. Why didn’t they talk about this part? Why didn’t they tell me how profound this experience was going to be? Was I so different from every woman before me who gave birth? I just wanted to shout “Did anyone see what I just DID?!?!?!”. I suddenly found it odd that we all just kept going about our normal day to day when women everywhere were becoming mothers and going through something so paramount as the act of childbirth. When my friends have new babies, I make it a point to ask always how they are doing first, because the mothers are the ones who are affected the most. We are the ones who are reeling from a major life changing experience, going through a hormonal roller-coaster, our bodies beaten and worn from a very physical event or recovering from a major major surgery that has become so normalized we often forget the very seriousness of a cesarean section. We are the ones delirious from sleep deprivation all while learning how to breastfeed and second guessing every part of it. We are the ones left with a body and a life that are unfamiliar to us. I think another point worth mentioning is that for most of history, women have been surrounded by other women made up of family and friends during the post partum period. This cohort of women would help them breastfeed and take care of the recovering mother and her chores so she could bond with her new baby. Now in our current nuclear family society where many of us do not live in close proximity to our families and with no real paternity leave to speak of, we are often left alone during this time despite visitors we often feel we have to entertain by custom. A sacred period once called “lying in” has turned into a race on how fast you can “bounce back”. We are expected to be the same person and do all the same things we did before. But we are not the same person, and we never will be. I attribute a lot of the baby blues to my birth experience which I talk in detail about in the post Why I Want An All Natural Birth but the truth is I have nothing to compare my birth too at this point and this is nothing more than a theory. I have spoken with mothers who have had traumatic emergency c-sections yet left the hospital smitten with their babies and no real baby blues to speak of and I have also spoken with friends who had great births but felt the same anxious dread and sadness over the lack of a bond in those early weeks that I had. There doesn’t seem to be any “rules’. But as far as the physical recovery of post-partum and the intense adjustment that comes with having a new baby that is something we all understand whether you were a c-section mama, a VBAC mama, or a first or third time mom, yet I don’t hear many women talk about this part- myself included. I think it is almost an unspoken understanding between us all- this tremendous thing we all did, that we all have in common- almost like a secret, sacred badge of honor that we all share. Maybe subconsciously that is why it took me 18 months to write this post. And even as the months and years go by, and the love hits you so hard sometimes it knocks the wind out of you, you will never quite believe it… not really. *I consider myself fortunate that the baby blues did eventually subside after the early weeks of adjustment; however, it is estimated that 600,000 women in the US each year suffer from postpartum depression symptoms. If you feel that the baby blues are lasting longer than a few weeks or return in the first year after birth, you are not alone – please start by finding support here. 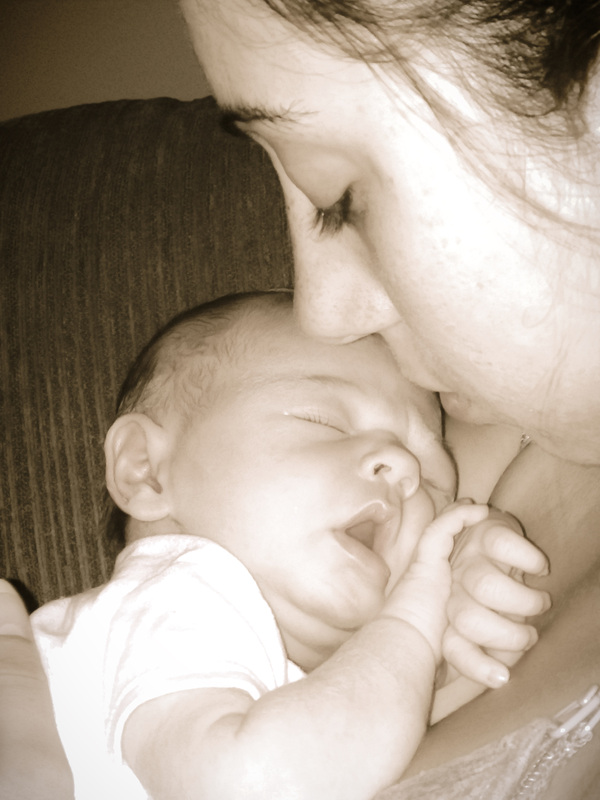 This entry was posted in Birth, Childbirth, Labor, Motherhood, My Journey, Postpartum, Pregnancy & Birth, Uncategorized. I’m not a mom….but I love reading your blog. You are so open and honest about your story and opinions! I think what you’re doing through sharing your story is amazing and empowering for other women! Great Job!